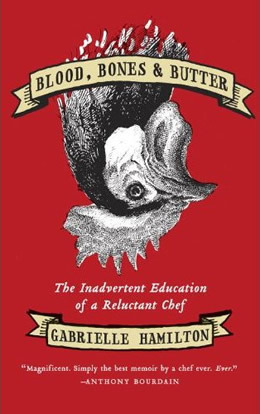 Let me say right off the bat that I was really excited to read Gabrielle Hamilton’s memoir “Blood, Bones, & Butter: The Inadvertent Education of a Reluctant Chef.” Not only is Hamilton the chef/owner of the restaurant Prune in New York City, but she’s also a bona fide writer with an MFA in fiction from the University of Michigan. Her work has appeared in The New Yorker, The New York Times, Bon Appetit, and Food & Wine, just to name a few. It was after reading one of her excellent articles recently in Bon Appetit about her family in Italy that got me very excited to read her book. The reviews on the back cover of the book simply glowed. Both Anthony Bourdain and Mario Batali practically fell all over themselves with such effusive praise and pedestal-placing words that I thought, “Oh man, this is going to be so good!” I mean, how often do you get a food book that comes along that’s written by an actual, good, writer? Well, I was really disappointed by Hamilton’s memoir. Maybe it’s because I let the hype cloud my opinion beforehand, but by the end of the book I was really questioning both Bourdain and Batali’s ability to discern good writing. Here’s what Hamilton is great at: She’s great at writing articles. They are finely crafted, well paced and a delight to read. She’s funny, brutally honest, and truly cares about the food she’s talking about. What she’s not good at is writing an entire book. The memoir starts off really strong with her recounting of her childhood in New Hope, New Jersey with her four brothers and sisters, her French mother and her artistic father. I enjoyed reading about her mother’s love of cooking, and her memories of how her father would throw a huge party every year with roasted lambs on a spit. She does an excellent job of defining her setting, and making the reader experience what she experienced as the youngest of five out in the country. I could also feel her despair as a teenager when what she thought was her loving, happy family suddenly came crashing to an end with her parents’ sudden divorce. She tells it through her childhood memory’s eye, and I got the sense that even after all these years, she’s still trying to sift through and figure out what went wrong. From there she pretty much tells in chronological order how her own young life started to spiral out of control as she got involved working in restaurants around her own small town. She bounces into college, she bounces out of college, and into catering for a summer camp (a particularly fun and interesting section to read), and then suddenly she’s landed in New York City with her sister and is heavy into drugs and a soulless catering gig. Here’s where I began to have a problem with her writing. One moment she’s found a festering space for a restaurant that no one wants anymore (but will become her famed restaurant), takes it, begins to clean it, and then suddenly, out of nowhere, she’s back in time on a European excursion where she learns some more cooking. Then, again just as suddenly, it’s four years later and she and her restaurant are a huge success, and she’s appearing on The Martha Stewart Show. There is no in-between. What should have been one of the most interesting and intriguing sections on how she became such an incredible chef, the trials of opening your own restaurant, etc., felt instead like a huge chunk had been mysteriously omitted. She even fails to tell why she’s on Martha’s show, and how she came to be asked to appear. It’s incredibly disjointed in that way. Here’s another example: For most of the book we understand that Hamilton is a lesbian, and has several monogamous relationships with women. Then, seemingly out of the blue, she has fallen for an Italian man who comes into her restaurant, and suddenly, bam! She’s married him – a little bit because of love, and a little bit because of his green card issues. She never lands on which it is. But what she does divulge is that even though they’re married, they don’t live together. But they also have two sons together. She doesn’t go into any type of depth about why that is, and I have to say, it’s unbelievably annoying and baffling. I mean, to each her own, but I just kept finding myself wondering “How did you get from this point A, to this point B?” She never fully explains. But she does go into great depth about her vacations with her husband to Italy to visit his family every summer, and these are arguably the best chapters in the book. It’s clear that while she may not be passionate about her husband (she waxes at length about his shortcomings), she is passionate about his family, and Italian cooking. This is where the prose truly shines as she revels in all the earthy, simple delights of Italian food. But just as I began to truly enjoy these passages, she started harping on why her “marriage” was falling apart, and then the book ended so abruptly I was left scratching my head. You could just tell that she had sat around with a writer’s group and they had all agreed that ending it in such a fashion would be edgy and artsy and soulful, but it’s not. She comes off at the end as being an incredibly unhappy woman. There’s an entire chapter missing that could somehow tie it all together and make sense of it. Let me wrap up by saying this: Hamilton is a good writer, but not a great one. If you really want to read something enjoyable by her, go check out her articles, because they truly shine. But do yourself a favor and skip the book.